Pasta bake is a quick dish that I make to use up leftovers in the fridge. I use whole wheat pasta which takes a little longer to cook than white pasta so I find it best to boil it before baking. I then add a tin of tomatoes and a fried onion along anything else that has been lurking the vegetable drawer of the fridge for a little too long and needs using up. This week I had some carrots and the last bits of some cheese, one was a spicy Mexican cheddar which I diced into little cubes and spread throughout the dish and the other was a mature Canadian white that I mixed with crushed crisps for a crispy topping. 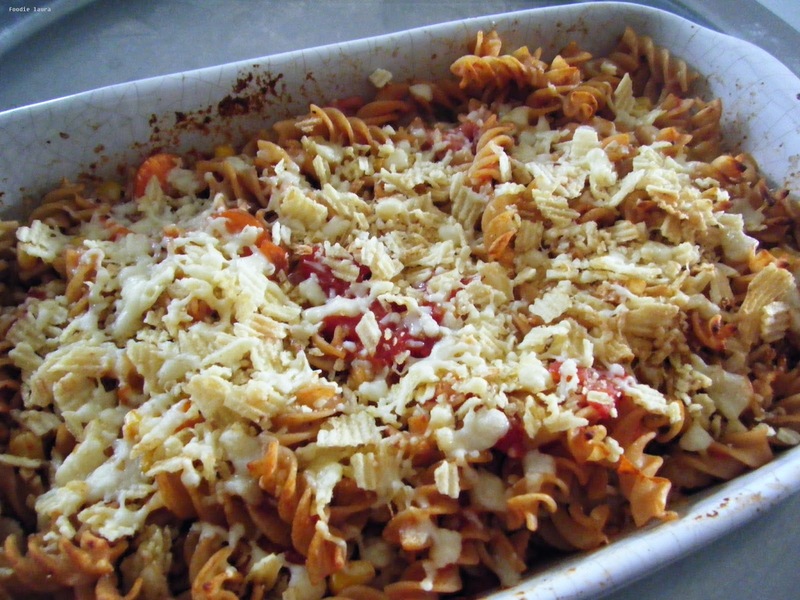 With a tomato pasta base and cheesey crisp topping you can throw any leftovers into this bake. As a child I always remember being amazed when we had crisps with pasta, crisps are for picnics and lunch boxes not for dinner. But they really finish off the leftover pasta bake, think of them as crunchy croûton. 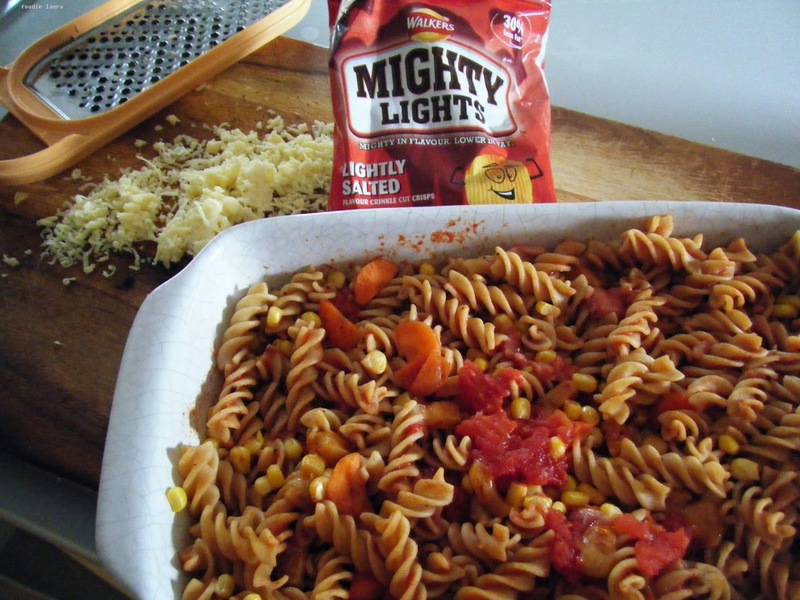 The crisps that I used to make the crispy topping were the new MightlyLights from Walkers. They aren't as thick as their baked crisps but they are ridged and have a good crunch. I used the lightly salted ones in this dish and didn't add any salt to the pasta. The crisps aren't overly salty but they had enough of it to be the only component in the dish. I rarely sit down to a bag of crisps as I usually gravitate to sweeter options and these actually do have a sweetness about them, I would pick up a bag again just for this pasta bake because they really do liven up the leftovers. I put an extra bag of crisps in my handbag in case I'm in need of a quick snack but I haven't eaten them yet. Trevor has been enjoying the other flavours which are cheese and onion and roast chicken. I'm not so keen on the flavourings of these. They both taste quite oniony. The roast chicken ones are suitable for vegetarians too, I'll never understand that, how can it be chicken flavour with no chicken in it? The chicken flavour comes from a blend of seasoning as these crisps have no artificial flavours or preservatives. I mentioned that the Walkers Mighty Lights aren't as thick as the Walkers baked crisps and that's because they are a lighter alternative, they are made with potatoes and have 30% less saturated fat then regular crisps. These healthy elements are designed to make the crisps ideal for lunch boxes. In a nod to the children there is a crisp with a drawn on face on the front of the pack. If you are back on lunch box making duty this month I can see that these would be an easy filler but they aren't very inspiring. *Sponsored post. Walkers provided their crisps and payment for this review. All opinions are my own.